Now instead there was a chapel, locked against entry, a place of rules and prohibitions, surrounded by graves and the thought of death and not flowers. 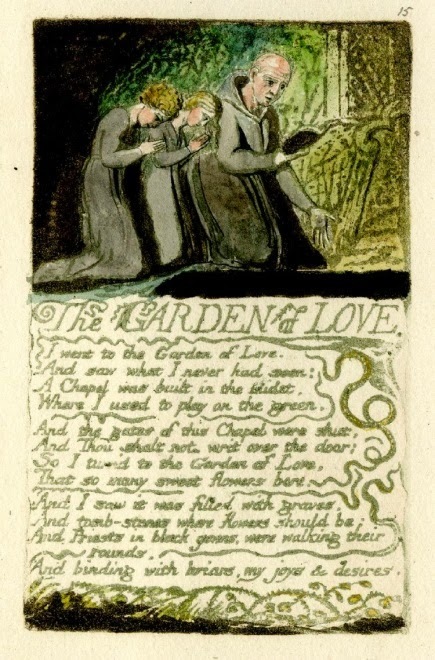 Black frocked clergy intrude in the scene clutching thorny briars and no flowers are to be seen and their scent is absent. Still called "the Garden of Love", it is now however a place of little joy and certainly not conducive to vision, the other senses and the imagination. It is a fraught time, an exciting time but without proper guidance one where idealism can give way to cynicism or worse. In a talk in Rome in 2003, J. Francis Cardinal Stafford, then President of the Pontifical Council for the Laity spoke of the World Youth Day in Cologne in 2005 and the challenges faced by young people as they embark on their journey. [P]ilgrimages call the young man and the woman to transcend their person as a moral being and to rediscover man the sinner. A pilgrimage means to go beyond moralism in religion, that caricature of Christianity when it is made reductively into a system of commandments and nothing more. The WYD pilgrimage makes evident to young people an all-pervading sense that, even though all the blunders, hypocrisies and even malice of our personal and collective histories have scattered and divided the children of Adam, that is not the end of the story. [T] he WYD pilgrimage will teach young people that, despite all human sinfulness and perverse cunning, they can still believe that human nature is one and good and overflowing with possibilities. God's love will reveal to them that human existence is unified and comprehensive. Much can be forgiven among those who have "loved much" (Lk 7:47). With each step on the pilgrimage the young pilgrims will be faced with their own fallibility and corruptibility. Likewise, they will be faced with the idiosyncracies and sinfulness of others. At the same time, they will learn a greater lesson: that no amount of human inconsistency and deviousness can quite manage to squelch the radiance of what God has created. It is He who is responsible for the intrinsic goodness of human nature."